Clowns & singers visit disabled, elderly or sick people in the neighborhood, spreading joy and sharing smiles. Approximately 20 bat mitzvah girls from the neighborhood come to learn about Judaism and have workshops on social skills & self-esteem. Our special bat mitzvah program for Ethiopian girls meets, which includes a special trip to the kotel and a communal bat mitzvah celebration with their families. 20 children and their mothers meet for story-hour and a mother-child craft activity. 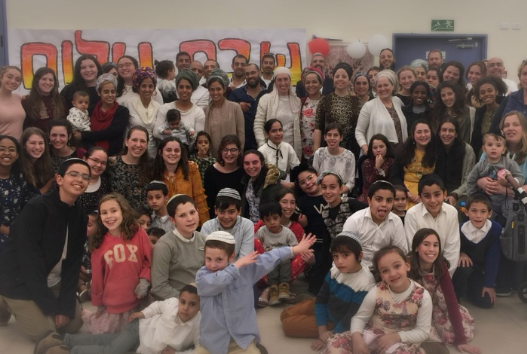 250 women from all sectors of society attend a weekly evening class with Rabbanit Yemima Mizrachi, laughing, enjoying themselves and learning together. 15 young mothers from the neighborhood attend parenting workshops and classes at Nishmat. Every week at least 1 bride, if not more, finds her wedding gown at the Nishmat Gemach (free gown rental). Nishmat organizes community events for Channuka, Tu B'Shvat, Purim & Yom HaAtzmaut. We are continually organizing new projects and dreaming big! Thanks to Nishmat's Community Outreach, Nishmat and the Pat Neighborhood are one! To support our community outreach programs, please donate to Nishmat directly, or through American or Canadian Friends of Nishmat by clicking on the flags below. Thank you for your support!